Hope you are all starting this week relaxed and happy! For today's post I'm sharing another holiday outfit, wearing this pastel blue off shoulder blouse. Not only is this blouse off shoulder, but it also has bell sleeves. How cute is that?! If you remember I shared another look featuring this one a while back, wearing it as a normal bell sleeved blouse. This time I paired it with lace shorts and this yellow colour-blocking clutch, to add a fun pop of colour! As you already noticed, most of my vacation wardrobe was off shoulder, fun, flirty and most importantly, comfy. I knew there would be 35 C degrees, so I wanted flowing and breeze pieces. What do you like to pack for a seaside holiday? This is such a cute outfit, love the lace shorts and off the shoulder top. You look so pretty, I love this casual look. I am obsessed with this off-the-shoulder top! You look so gorgeous in light blue! The outfit works well for you and the photos look pleasant. Could imagine these as polaroids to be hung on a wall. Nice. You look great, Carina! Love this outfit, especially the clutch. I love this outfit so much Carina, the shorts are just gorgeous and that top too. The place is just so perfect for blog photos! Love your outfit! 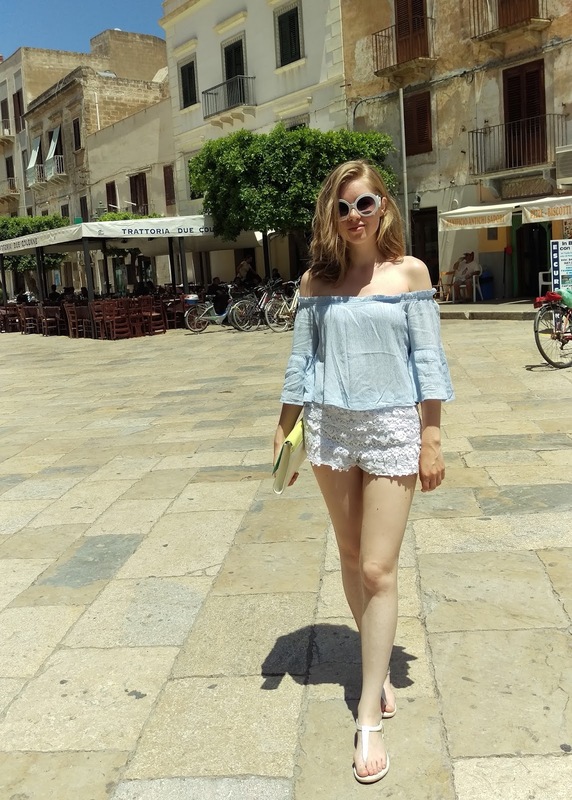 The OTS top is perfect for exploring while on vacation! I absolutely adore those shorts and top! It's a simple but chic look and I can totally see myself wearing it! Lovely outfit, you look cute. I love off the shoulder tops! this one is soo cute! Anything pastel is my style! Love OTS pieces!! I also like to pack lightweight and breezy pieces that are easy to throw on and wear all day while on vacation! What cute lace shorts! And I'm loving those sunglasses! Great photos! Gorgeous......i really love the shorts! Gorgeous, Carina! LOVE your off-the-shoulder top! SO chic! Gorgeous outfit and I love the shorts! Love your lovely outfit, you look stunning, thanks for sharing!!! Those sunglasses look great on you! So sweet) pastel shades suit you! Beautiful shots! You look Gorgeous! That's the cutest summer top! I love the lace shorts too! Such a simple, breezy look. Off the shoulder anything always works! Oh where in Italy where you? Looks like a cute town! Sicily looks absolutely stunning and love this look!! Summer chic has never looked better! I have a similar top that I absolutely love! What a gorgeous summer outfit and pics. GIVEAWAY: Win a Pink Instax Mini 8! Wow, so beautiful!!! Love this look! I like shoulder off clothes:) You look perfect! I love this whole outfit so much! Super cute :) And I love the location of your photos too! Blue color blouse is perfectly, especially with a nice shorts! I love off the shoulder trend and lace is an obsession of mine. So cute! Such a lovely summer look dear! These photos are so pretty and I am so in love with this location! Cute look Carina! Love those shorts! Love the off-the-shoulder with this, lady! Such a pretty holiday outfit! I love the colour and style of that off shoulder! Wow, such beautiful off shoulder blouse. You look absolutely stunning in this outfits. Very freash and cute outfit, hun! This is such a lovely outfit, girlie! I adore those crochet shorts especially, as well as those sunnies! Thanks so much for sharing and I hope you're having the best start to your week so far! You always look so stylish :D Love it! You look amazing! Loving this look! Those sunnies are so cute! Beautiful. I'm in love with your shorts. Chambray and white is definitely my fave summer combo. Love the off the shoulder detail of this top too. Great look girlie! Essa blusa está linda, combinação perfeita! Amazing summer look. Love it! Loving your sea-side look! Anything OTS is perfect in my books! I'm actually in the midst of packing for a sea-side holiday and I'm planning on bringing maxi dresses, skirts and swimsuits. Off the shoulder trend is always a good idea! Lovely outfit! I love the top colour :) For a seaside trip, I'll definitely take with me a bikini and linen clothing. Absolutely loving everything about your look, and in such a picturesque setting <3 Seriously those glasses! Such a lovely summer look and beautiful photos dear, thanks for sharing! Have a wonderful time in Italy. I definitely like this look better than the other one. The off the shoulder style suits you so well! I love how you paired it with the yellow bag. I love your summer outfit!! Oh what a lovely top! And looks spot on with the scalloped shorts. And perfect for the super hot weather. How perfect for a summer holiday near the sea! Love your outfit! Gorgeous outfits! love the off the shoulder top :) You are so beautiful! Cute outfit and especially clutch! beautiful photos !i love italy!! Such a pretty holiday outfit!